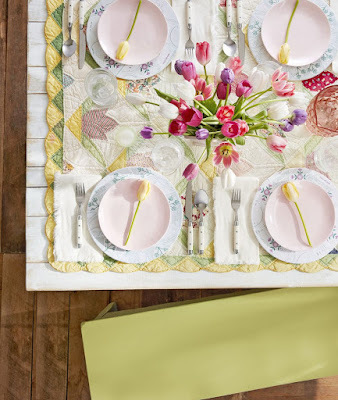 Sometimes, simplicity really is best, as these crowd-pleasing valentines demonstrate. Tape on bubble gum and write: You blow me away! Tape on a Snickers® bar and write: You make me laugh! Tape on a small bag of Fig Newtons® and write: It "fig"-ures we're friends. Tape on a small bag of Craisins® and write: I'm "crais"-y about you! 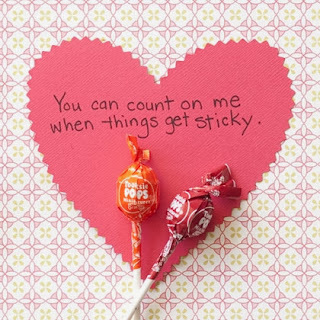 Tape on a small chocolate-covered mint and write: Be cool, valentine. Tape on malted milk balls and write: Have a ball this Valentine's Day. Tape on a snack bar and write: You're the best, bar none. Tape on an Almond Joy® candy and write: You're a joy to be around. With a body made of chewing-gum sticks and licorice-whip antennae, this valentine will be lucky to make it through lunchtime. Place two pieces of string licorice between two sticks of gum, taping the top and bottom closed to secure the antennae in place. 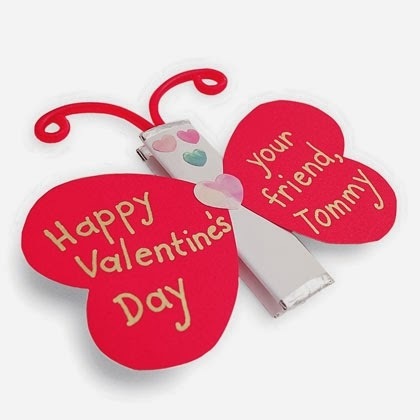 Next, cut two heart-shaped wings from construction paper, write your valentine message on them, and secure them to the top stick of gum with a heart sticker. Add other stickers to give personality to your butterfly. Trace your child's feet on colored card stock or heavy construction paper and cut out the shapes (use them as a template to make more cards. Glue 2 feet at the heels to form a heart, as shown, and use a paint pen or marker to pen a message. Glue flat-bottomed plastic jewels (available at craft stores) to the toes for polished nails. Your child will lift his classmates' spirits into the stratosphere with this valentine made from a Hershey's Kiss and Life Savers candy. 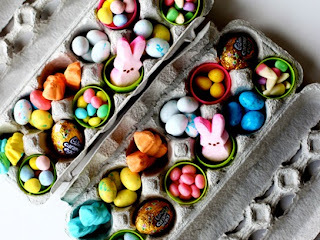 For the body, cut the paper to fit around the roll of candy, including a bit of overlap. Tape the paper to the roll. Cut the tail flames and include a 1/4-inch tab, as shown. Snip the tab in half along the solid line, fold the 2 flaps in opposite directions, and tape the flame to one end of the candy roll. Tape a wrapped chocolate kiss to the other end. 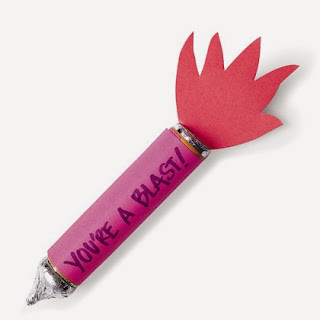 Use a marker to write your message on the rocket or the flames. Helpful Tip: Write the recipient's name on the flames shooting out the back. It's hard to resist Valentine's Day suitors when they come bearing sweet treats. Use the tack to poke arm and leg holes in the card. Position one set of holes an inch from the top and the other half an inch from the bottom. For the arms, fit the ends of one pipe cleaner through the upper holes from the back of the card. Fit the other pipe cleaner through the lower holes to create legs. Bend the ends of the legs to shape feet. 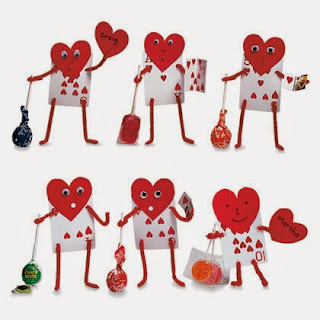 For a head, cut a heart shape out of construction paper. Glue on googly eyes and draw on a nose and mouth. Then, glue the head to the front of the card. Finally, wrap one arm around the lollipop stick. If you want to include a Valentine's message, write one on another paper heart and fit it on the tip of the valentine's free hand. Cupid's calling! 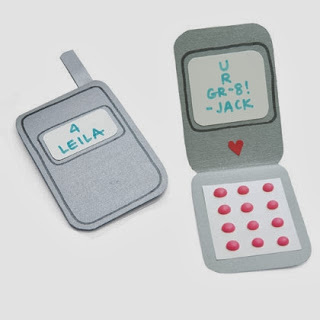 And we've got the perfect answer: a candy-button phone that tells your valentines they're worth every minute. Cut a rectangle from silver card stock (ours is about 2 1/2 by 7 inches), then fold it in half and round the corners. Glue on a card stock antenna, two paper message screens, and the candy keypad. Here, two classic Valentine's Day gifts — flowers and candy — combine to make one sweet treat. For each, cut three heart-shaped petals, two leaves, and two flower centers from scrapbooking paper or card stock. 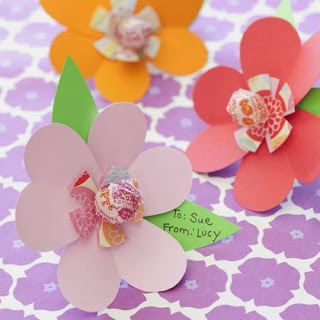 Poke a small hole in each, crease the petals as shown, and slide the pieces onto a lollipop stem. Tape the bottom to secure. 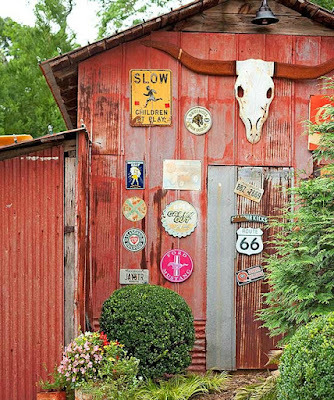 As every parent knows, kids have a knack for leaving their fingerprints on everything. Now they can use this incredible skill to crank out a whole mess of adorable cards. Use the paintbrush to spread a thin layer of paint on the bottom of the paper plate, this will be your ink pad. Have your kids dip their thumbs into the paint and print them on the card. 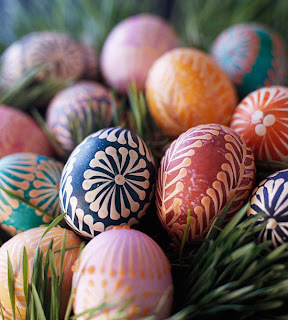 Their thumbprint will be the bunny's head. For the ears, have them press down only half of their thumb to make a long, skinny shape. After the paint dries, they can decorate the face with markers, adding whiskers, eyes, and a nose. 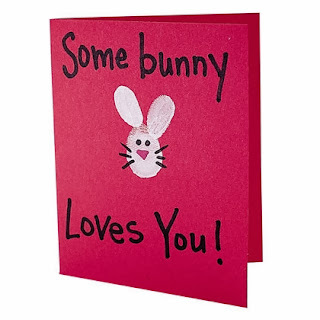 Use a black marker to write "Some bunny loves you!" on the front of the card. Helpful Tip: Even a really young child can make the thumbprints. 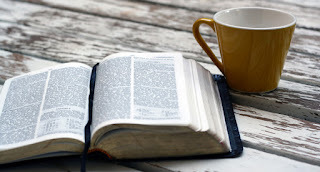 A parent or an older child can offer to help out with the features and writing. Want to brighten someone's day? Do like the Upton boys, 2-year-old Jeremiah and 4-year-old Jackson of Millersville, Maryland, and give a glow-stick valentine to tell loved ones they light up your life. 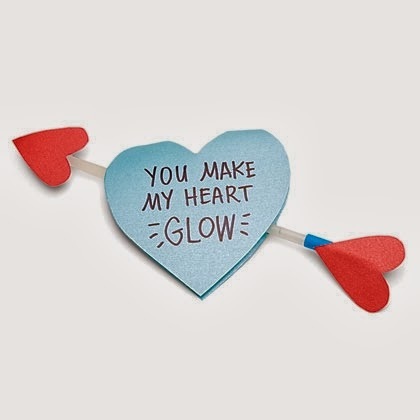 Simply punch two holes in a folded card stock heart, then insert a skinny break-and-shake light stick decorated with a heart-shaped point and feathers.